BERN, Switzerland — Voters in Switzerland are getting ready to decide whether they should have to keep paying hundreds of francs every year for public television and other government-supported programming, a referendum that is being watched closely elsewhere in Europe. The vote to eliminate the mandatory national TV fee was sponsored by free-market proponents and other fee critics, who say residents shouldn’t have to pay for public broadcasting if they watch or listen to it. 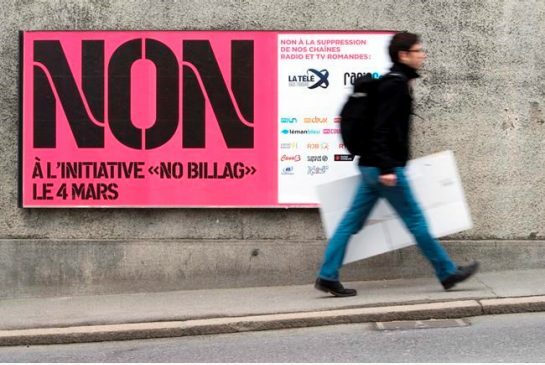 Opponents of the "No Billag" vote — named for the company that collects the fees — argue that ensuring quality programming in an era of false news and media profits is in the public interest. Balloting concludes Sunday, when mail-in votes also will be counted to produce the result. Polls last year suggested that most Swiss were ready to scrap the fees, but more recent surveys indicated about two-thirds of voters will reject the proposal. Supporters of fee-supported radio and TV stations mounted a public relations blitz that all but painted Swiss culture and distinctiveness as being at dire risk. They enlisted celebrities to help push their message, warning that cherished news shows, music and film programming and free access to Olympics coverage could be ended. Both Switzerland’s parliament and seven-member executive body, the Federal Council, have come out for keeping the fee requirement. The issue resonates across Europe, where other fee-supported broadcasters have gotten grumbling about mandatory charges from some viewers. Currently, Swiss households pay just over 450 francs (about $480 or 390 euros) per year. Billag agents often go door-to-door making collections. The fee is set to decrease next year to 365 francs (about $389 or 316 euros), but the referendum is based more on principle than precise payments. Defenders of the fees, relatively high by European standards, insist that Switzerland needs to charge more because the country has a high cost of living and four national languages. Public broadcasters strive for balance and to make sure even the tiny Romansh-speaking community in southeast Switzerland gets time with German, French and Italian speakers, they say. Referendum opponents also argue that if Switzerland’s public broadcasters disappear, rivals from elsewhere in Europe would step into the void and provide fewer Swiss-specific shows and news programs. "What would be obviously terrible is that the great moments that unite the country — I think of course the news, but also film, culture, and music production — all that will disappear," said Gilles Marchand, director of SRG SSR, the parent company for publicly supported broadcasters that reaps 1.2 billion francs from the TV fees each year. "Will we really be better off because of this one franc per day that people can re-invest elsewhere?" he said. The initiative’s backers say it’s a question of free choice in a democratic society. By ending what they call a "quasi-monopolistic" Swiss broadcasting universe, families would have another 450 francs in their budgets. The referendum’s organizers insist the aim is not to kill off public TV and radio, but open it up to competition. While the initiative’s language does not mention SRG SSR and its affiliates, critics have taken shots at what they see consider the overly high salaries of its executives. "It’s fake news to say that ‘No Billag’ is the end of (German-language network) SRF and all the other medias, because we are sure that this company with 6,000 employees and a very good infrastructure, that they can win in a free market," Christian Riesen, one of the leaders of the campaign against the fees, said.